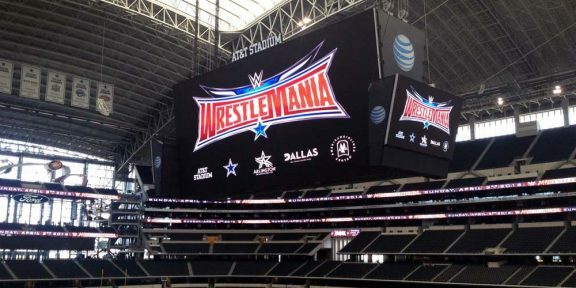 This Sunday, over 85,000 fans will pack the AT&T Stadium near Dallas, Texas (regardless of whatever attendance number WWE announces), as the thirty-second WrestleMania comes to pay-per-view. BackBodyDrop.com and Wrestling-Online.com will have live updates throughout NXT Takeover: Dallas and WrestleMania, but in spite of the poor quality of creative that has gone into this show, hastened by WWE’s excruciating injury problems, this is still likely to be the most-viewed wrestling pay-per-view of the year. 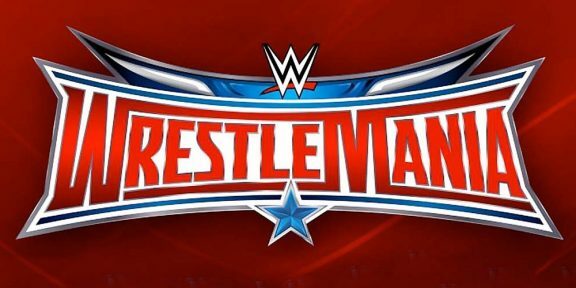 WrestleMania is likely to run beyond five hours long, and to fit it in, WWE has eleven matches set for Sunday’s show – so there’ll be an awful lot of faces on the card. Thanks to 888sport we’ve got odds for you for some of the matches, and a couple of specials as well. Do you feel that Donald Trump’s ego is so big, that he’ll believe he can do WrestleMania and the White House in the same year? 5/1 says he will, and 1/10 says he won’t… meanwhile, you can get odds of 6/4 for Ronda Rousey to appear at her second WrestleMania in a row. This year’s monstrous WrestleMania card – according to PWInsider – will feature a four-match and two-hour long pre-show, with a title match thrown into the mix. Odds are correct as of time of March 28: please check 888sport for their current prices – and don’t forget to gamble responsibly, folks! Poor, poor Kalisto. Having won, then lost the US title just before the Royal Rumble, Kalisto got his big moment of glory at the January PPV, and then again at the Fast Lane show, beating Alberto del Rio on the pre-show. Since then, Kalisto’s push has been somewhat schizophrenic, as WWE struggles to decide whether he’s a singles guy or a tag team competitor (following the return of Sin Cara). There’s no such concerns with Ryback, and given that he’s just had a heel turn and is striking out on his own (following that oh-so-memorable tag team of his…), I’m sensing a title change here. Ryback is odds on here at 13/20, whereas Kalisto retaining is 11/10. Next on the pre-show is (hopefully) the blow-off to a tag team feud that’s barely simmered. The Dudleyz turned heel on the Usos on Raw a few weeks back, but they haven’t featured much on television since. This has become a nothing match, but you can take the Usos at 1/2, or the Dudleyz at 7/5. At least we now know that nobody on creative either watches NXT, or remembers Eva’s last run in WWE (mostly as a heel). Or perhaps we’re all missing a series of shows where Eva was portrayed as a babyface. Did NXT have a secret tour of North Korea or something? Anyway… good luck getting that one over in Dallas! Originally planned for the pre-show, as of Wednesday this has been moved to the main per-per-view and will be continuing the tradition of “throwing everyone else on the show who hasn’t gotten a match). With WWE’s injury problems, and the already extensive card, there aren’t that any faces who can slot in here, so perhaps we’ll see a few NXT faces to pad out the card. If there are, hopefully they’ll be treated better than Hideo Itami, who won a tournament at last year’s Axxess events, only to be treated like a joke on the show itself. Prior winners Cesaro and Big Show haven’t exactly enjoyed a career renaissance, so the winner of this shouldn’t be expected to receive a push. Braun Strowman, who at one point was tipped to face the Undertaker at WrestleMania, is the favourite with 888sport, and is odds-on at 4/5 (put £5 to win £4, plus your original £5 stake). Other notables include Mark Henry at 7/2, the possibly injured Bray Wyatt at 5/1, and the definitely injured Luke Harper at 25/1. As for the NXT names, you can take Shinsuke Nakamura at 40/1, Baron Corbin at 17/1 or ZZ at 1000/1, if you want to mindlessly punt your money away on a guy who has only just made his NXT live event debut. Since WWE replaced the Money in the Bank match at WrestleMania with its own dedicated pay-per-view, secondary titles seem to have become the defacto match to be held under ladder rules. Last year saw Daniel Bryan win the Intercontinental title as his career came to an untimely end… this year, we’re likely to see more insanity, even though Neville’s ankle injury rules him out of this match. After the New Day overcame Wade Barrett and Sheamus at the Roadblock event, this one isn’t going to be a tag team title match, but instead, a 3-on-4 handicap match. I’m not expecting anything special here in terms of the match, but given that the Rock has been announced for the show (and that’s about it), don’t be surprised if the on/off Rusev battles continue here. Three months ago, this would have been interesting. Heck, three months ago, AJ Styles was still contracted to New Japan Pro Wrestling, and he hadn’t even announced his decision to leave for WWE. Since then, AJ made a surprise debut at the Royal Rumble, has had what felt like a thousand interactions with Chris Jericho, and has become just another guy who falls for distraction finishes. Technically, this should be the best match of the night, but it’s going to be tough to be invested in a match that was only announced days before the show, let alone one we’ve seen three times, in addition to their short-lived tag team that was killed off before it went anywhere. AJ’s won two of their three matches so far, but I’d guess that WWE will make it a hattrick of wins and finally end this storyline, rather than keep this going back and forth. Unfortunately for Dean though, I cannot see him winning – they pay too much money for Brock, and Ambrose seems to be slotted in the same way as Becky Lynch – always the bridesmaid, never the bride. Ambrose is a 4/5 shot to win, whilst Lesnar is the slight 9/10 favourite. Well, they’ve tried for almost two years to have us cheer Roman Reigns as a top singles babyface. Last year, only a decision during the show itself saw Reigns’ WrestleMania moment taken away from him, with Seth Rollins’ Money in the Bank cash in seeing him win the big one instead. This time around, there is no similar get-out clause, and I ordinarily wouldn’t see any other result than a Reigns win. Except he’s being rejected worse than he ever has before as “the guy”, and a part of me sees WWE calling an audible and have it play into the other main event. Well, this has been a weird one. So many stacked gimmicks for a match that really should have been so simple. The bookmakers are undecided here, with Shane edging it at 9/10 favourite, and Undertaker at 4/5, so perhaps its some of the specials that should take your fancy? For instance, Shane is priced at 7/5 to take a dive off the Hell in a Cell, whilst you can get even money on any member of the Mean Street Posse to appear. The result of the match itself would raise questions either way. WWE has released a fair bit of merchandise that seems to indicate that a brand split is returning, so you’d suspect that Shane is winning. But given the other stipulation is that if Shane wins, Undertaker can’t appear at WrestleMania ever again – which kinda backs WWE into a corner again.Given how the writing has gone, I’d suspect that WWE would go for a draw here and have Shane “run SmackDown” (as leaked images of new WWE action figures has Triple H listed on the back a featured Raw superstar), but I don’t know smart an idea it would be to end WrestleMania with a draw. When they did it for John Cena vs. the Miz (before the Rock got involved) it killed the crowd… and I can’t see Hunter vs. Roman being able to get any sort of crowd reaction should that go on last after a draw here. BackBodyDrop.com and Wrestling-Online.com will have live updates throughout the biggest weekend of the year, with live results throughout NXT Takeover: Dallas and of course, WrestleMania 32.